Rapid removal of wood material with the ease of free hand styling. Tungsten carbide teeth means long life and only requires easy touch up maintenance with a diamond lap stone file. 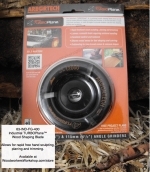 Fits most 4 inch (110 mm) and 4.5 inch (115 mm) angle grinders. Turn your angle grinder into a fully functioning tool to shape wood easily and safely. Perfect for shaping, cutting, trimming, carving and hollowing out trenches. This accessory tool can be used with the Arbortech™ product line of power carving woodworking tools. WoodworkersWorkshop® is an Authorized Distributor for Arbortech™ tools, carry a full line of woodworking tools, accessories and replacement parts.